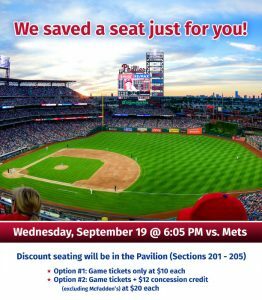 Special Olympics USA • SO USA Training Camp is Coming to Delaware and the Phillies Game – Join Us! SO USA Training Camp is Coming to Delaware and the Phillies Game – Join Us! On Monday, September 17th, freshly nominated athletes from across the USA will meet in Newark, Delaware to train with their Special Olympics USA coaches and bond with 200+ other nominees from across the country before traveling to together for Special Olympics World Games in Abu Dhabi next March. A highlight from Training Camp week will include a team bus trip to watch the Phillies vs. Mets game on Wednesday, September 19th. We’re thrilled to extend you this discount ticket offer reserved exclusively for friends and fans of Special Olympics USA! Participating athletes will train in 16 sports: athletics, basketball, bocce, bowling, cycling, equestrian, golf, gymnastics (artistic and rhythmic), powerlifting, sailing, soccer, swimming (aquatics), table tennis, tennis, triathlon, and volleyball.